SHIGA (TR) – Shiga Prefectural Police have arrested a 68-year-old man over the abandonment of a corpse found in a canal in Kusatsu City earlier this year, reports the Sankei Shimbun (Oct. 3). Police on Wednesday arrested Tomoyoshi Yuzuriha, the manager of a restaurant in Moriyama City, over the alleged destruction and abandoning of the corpse of 69-year-old Sunao Nakagawa sometime in early August. Yuzuriha denies the allegations, according to police. 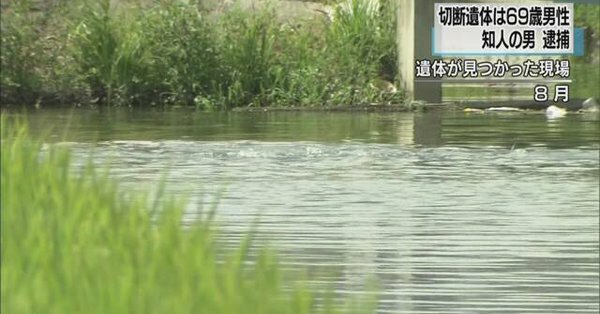 On the morning of August 11, a male jogger tipped off police about the discovery of a corpse later identified as belonging to Nakagawa, which was floating in a drainage channel used for agriculture in the Shina area. The body’s arms, head and legs had likely been severed with a knife, leaving only the torso, police said at the time of the discovery. At around 6:00 p.m. that same day, a team of about 60 officers scouring the surrounding area found another portion of a body, extending from the lower back to knee, on a river bank about 350 meters southwest of the first location. Yuzuriha and Nakagawa are acquaintances dating back to a time when they both worked for construction companies. The arrest in the case is the second for Yuzuriha. Police previously accused him of stealing a bank card from Nakagawa and taking 700,000 yen from his account via an ATM machine. Since no bloodstains were found near where the body parts were discovered, police suspect that Yuzuriha dismembered the body in other locations. Police believe that the suspect and victim engaged in a money-related dispute.